Is it possible that spoilt ballots could be another way some people choose to express their will during general elections in Ghana? Electoral actors in Ghana have been worried for some time now about the incidence and percentage of spoilt ballots at our general elections. These spoilt or rejected ballots are normally seen as mistakes made by ignorant, illiterate voters who didn’t know how to exercise their franchise. But it has emerged that not all rejected ballots are spoilt ballots as far as some voters are concerned. We have reason to believe that some rejected ballots are in fact a rejection of all the candidates or issues on the ballot paper by some voters. We know for a fact that the Electoral Commission of Ghana has been struggling to stop the phenomenon of having too many rejected ballots without much success so far. At the 2012 general elections for example, there was about 2.8% of total votes declared spoilt and rejected. This means the rejected ballots were not countered for any of the candidates contesting for the presidency or parliamentary seats at the time. Furthermore, the NCCE (National Commission on Civic Education), which is the national institution responsible (among others) for providing civic education in the country to ensure people make informed decisions on election days, has come under serious condemnation for doing too little to educate the public on how to cast their votes properly. But the big question is, is it the case that all of the so called “rejected ballots” are truly spoilt ballots? Also, have the relevant institutions researched enough into understanding why we keep getting spoilt ballots at every General Election? We ask these questions because information reaching us shows that not all rejected ballots are due to mistakes or ignorance on the part of the voter. To some people, that is the best way to express how they feel if they do not like any of the candidates on the ballot paper. 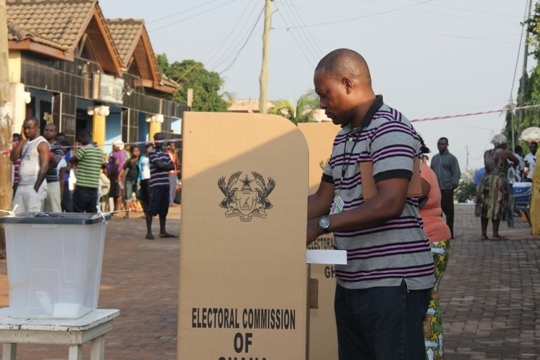 According to one lady from a suburb of Accra in an interview with our officers, on political participation in Ghana during the 2012 general elections, some parliamentary candidates in her constituency offered her money in a bid to influence her decision as to who to vote for. She said she got irritated and decided to thumb print for both of them since in her opinion none was qualified to have her mandate. She also stated that she knew absolutely well that thumb printing for two candidates on the same ballot paper is not acceptable and would be rejected by the electoral commission, but decided to do so anyway. This shows that not all so called spoilt ballots are actually spoilt in the view of the voter. Because for some people, it is not that they don’t know how to cast their vote properly per the EC’s regulations and procedures, it’s simply their way of expressing their will as to how to effect political change. In our view, if this category of voters does it deliberately and freely to signify their dissatisfaction or displeasure with the options presented to them; then they are entitled to that. Although the EC and other stakeholders might not be happy about this lady’s method of effecting change or otherwise, as far as she is concerned, it is her decision and her right. Article 21(1) of the Universal Declaration on Human Rights clearly states that “Everyone has the right to take part in the government of his country, directly or through freely chosen representatives.” This obviously indicates that the individual voter is at liberty to reject any one or all of the candidates if he or she so desires. Of course no one can deny the fact that not all spoilt ballots can be the result of deliberate action by voters. There may be genuine mistakes due to lack of knowledge about the right way to cast a vote. Yet, one can also deduce from this lady’s confession that a portion of all rejected votes could be deliberate choices and this must be acknowledged and treated as such. The message to all stakeholders therefore is that, the illiterate voter is not always as dumb as some think. And, not all rejected ballots are mistakes – some of them are done deliberately by people who know what they are doing. Perhaps, it is high time we start thinking of incorporating “OTHERS” as an option on the ballot paper, to cater for those who do not like any of the candidates presented by the political parties. This way, political parties will possibly be compelled to present to the electorates very good candidates, not just any personality; and we may also be able to reduce the number of spoilt votes at the next general election. What do you think?